[FIFA] The Handicap Mystery Finally Solved! "One of the most controversial subjects in the FIFA community is that of Scripting/Momentum/Handicap (for the purposes of brevity, I’ll call it handicap in this post – though I’m aware that scripting and momentum refer to slightly different issues). Handicap is described as the feeling of sluggishness, poor ball control and general bad luck that some players with a high-rated team experience when they face a player which has a low-rated team. This only seems to happen when they face a team which is substantially lower rated than theirs, hence why it is referred to as “handicap” – almost as if the game is compensating for their opponent’s poorer players." I went on to explain that it was a controversial subject and how bringing it up on official forums would get the post deleted and after many years of the theory being decried by official and unofficial sources as false, it was considered superstition or conspiracy theory. Today we might finally have cracked the case. Users /u/RighteousOnix and /u/TheFakeNepentheZ (someone whose practices with regards to coin selling I do not agree with, but in this case I must concede has done great work), seem to have pinpointed exactly the issue which we've struggled with since the advent of Ultimate Team in 2010. This is potentially HUGE, as it will confirm the suspicions of thousands of FIFA players over many many generations of the game. It will show that EA either knowingly or unknowingly has been handicapping high rated teams in contrast to low rated teams, and it will vindicate all us supposed nut-jobs who have been arguing that handicapping really does exist and its not just in our heads. To explain the glitch I will need to explain two important features of FIFA Ultimate Team mode - chemistry and upgraded cards. Chemistry is the degree to which your players work well together - the higher the chemistry your player has, the better he will perform on the pitch. You can raise the chemistry of your players in a number of ways, play them in the correct position, play them alongside players from the same league, team or of the same nationality, assign them a manager from the same league or of the same nationality and so on. 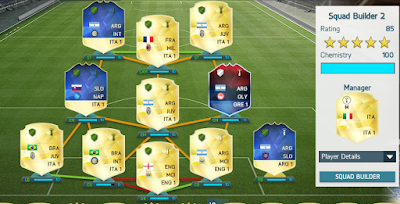 Players can have chemistry score of 1-10 (in FIFA16 at least). What chemistry actually does is that the higher your players chemistry score, the more his in-game stats are boosted, conversely the lower the chemistry the more his stats are reduced. The threshold is chemistry 4: at chemistry 4 your players stats in game are exactly as they are displayed on his card. Anything from chemistry 5-10 and your player will be getting his stats boosted, between 1-3 and his stats are reduced. It turns out that there is a glitch where certain players will be considered to be at 4 chemistry regardless of any other measures you take to increase the displayed chemistry score. But this glitch only occurs for what is now known as "non-day 1 cards". It has a pretty picture and its black and most importantly it has better stats. His pace stat (PAC) has gone from 94 to 95, shooting (SHO) from 83 to 86 and passing (PAS) from 83 to 85 and so on. For that week (Wednesday to Wednesday) this card is available in packs. At the end of the week it stops dropping and the original card returns to packs. 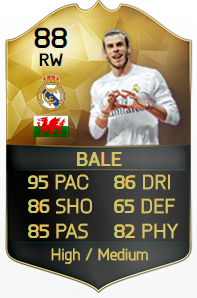 The 87 rated Bale card is his "day 1" card, the 88 rated is an "in form". 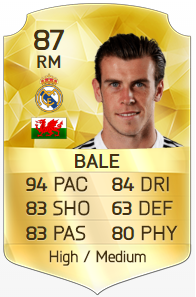 There are other types of changes to cards, sometimes EA will release position changed cards (Bale has one in a striker role, as opposed to his right midfielder role on his original card), and at the end of the year the very prestigious "Team of the Season" cards are released and these cards often go for many hundreds of thousands of coins. 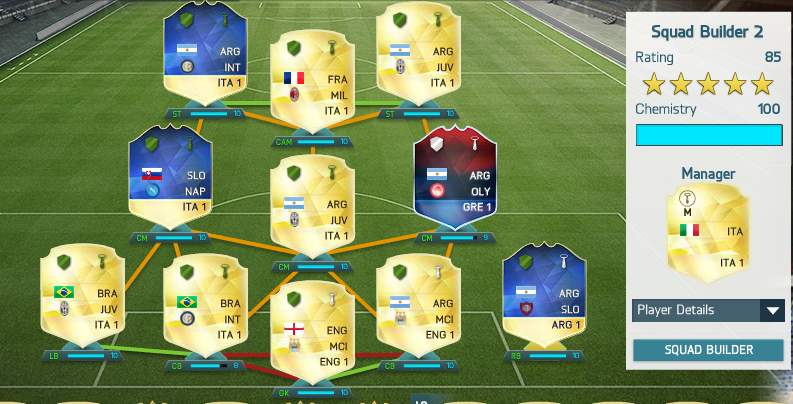 What our intrepid FIFAites have discovered is that chemistry is bugged for any card which is not the "day 1" version. Day 1 versions of cards will receive all the proper boosts which come from achieving 10 chemistry score - that is, a significant boost to in game stats. Whereas any other version of the card will only ever be considered to be on 4 chemistry and will therefore receive absolutely no benefit from increasing his chemistry to 10. This means that sometimes the day 1 card on full chemistry will have better stats than the considerably more expensive in form versions of the card, as these non-day-1 cards receive no chemistry boosts. All credit to MarakariPrime - contacts on the image. Here you see the leftmost card is his day-1 card (NIF means non in form), compared to his day-1 card with 10 chemistry in the middle, and his recently awarded man of the match card on the right. Notice how the middle card is almost as good, and often better, in stats than the rightmost card. His pace, shooting, passing and dribbling are better than the significantly more expensive MOTM card, and his defending and physical stats are almost as good. Same again here - the leftmost card is Aubameyang's day-1 card. The right-most is his exceedingly expensive in form card. The second card from the left is his 82 rated day 1 card with full chemistry and it is superior in every stat compared to his 85 rated in form card, as well as being significantly better than the upgraded 84 rated card he received in the winter upgrades list (which, as it is not a day-1 card, is also glitched). This glitch has not been discovered until now because the stats boosts attributed as a result of high chemistry scores are not displayed on the card, instead they are hidden. 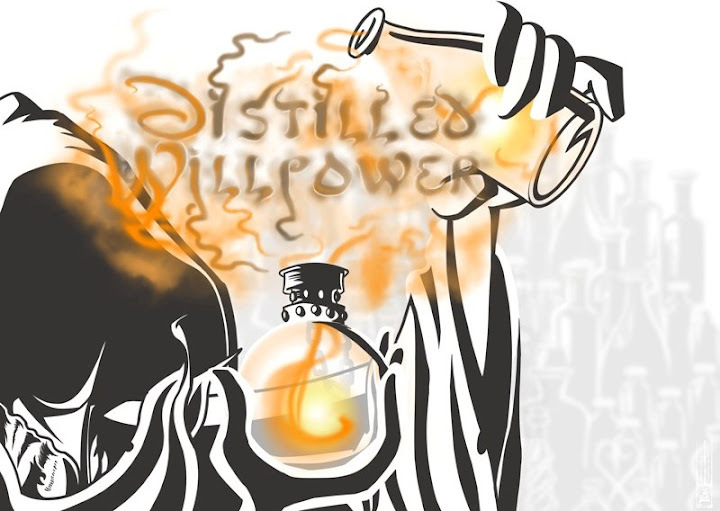 So the only way we've been able to tell the difference is the way the player feels to play with in game - which is a nebulous concept to pin down. THIS is why sometimes high rated teams feel slow, awkward and clumsy in comparison to low rated teams. Low rated teams will contain many of the cheaper "day 1" cards which receive significant boosts to stats from their chemistry score, whereas higher rated teams full of upgraded versions of players will only ever be using their base stats as if they are glitched on 4 chemistry. I have to say, if this is proven to be true then it is really satisfying to be vindicated in my assertions that there was something effecting the performance of highly rated teams in FIFA. How or why this glitch made it into the code for FIFA in the first place and exactly how it seems to have survived not only many generations of the game itself, but also survived the jump to a whole new console generation we might never know! But by highlighting the problem to EA perhaps it might be fixed in time for FIFA17 later this year. Below is a few of the technical details as to how this glitch was discovered, as well as RighteousOnix's original video explaining how he uncovered it.